Never Before Offered. N&W Coffee! Start your day with a cup of the original 1920s roast of N&W Coffee. Period ads touted the coffee as “the best that is made”. This coffee mix was thought to have been lost to time. 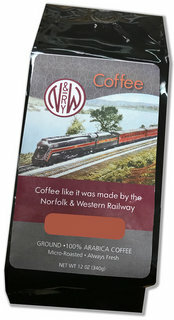 The N&W used this coffee up to the late 1940s and switched to another brand for a time, then another change to a Roanoke based coffee company which remained in service through May 1, 1971, we hope at some point to bring that coffee for sale at some point in the future. This coffee is produced using the finest beans to produce the coffee in small batches, choose either decaf or regular in 12 oz vacuum sealed bags. Enjoy a 12 oz of Ground 100% Arabica Coffee Micro-roasted and fresh.